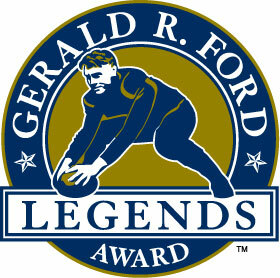 In the summer of 2005 The Rimington Trophy and the office of President Gerald R. Ford announced the creation of the Gerald R. Ford Legends Award. President Ford was the first recipient of the annual award that will bear his name for future winners. The award will be presented to former collegiate or professional centers who, in addition to standout football careers, have also made significant contributions to the football and/or business communities, or through philanthropic endeavors. "I look back on my days as a center at the University of Michigan as one of the best times of my life. The leadership lessons I learned on the football field served me well in my political and public service career. I am honored to be the recipient of this award and I truly appreciate the hard work that Dave Rimington and everyone associated with the Rimington Trophy have done to promote the significance of the center position in college football," said President Gerald R. Ford. 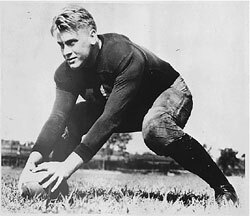 Gerald R. Ford was a successful center at the University of Michigan prior to entering a career of public service. President Ford rose through the leadership ranks of the Republican Party culminating with his appointment to the Presidency of the United States of America. The addition of the Gerald R. Ford Legends Award will continue to draw attention to the position of center, which is one of the major goals of the Rimington Trophy. The award will be presented during the annual Rimington Trophy banquet held each January in Lincoln, Nebraska.